Rohde & Schwarz RTM3K-34 oscilloscope 350MHz 4 channels, high performance. The RTM3000 series is characterized by the 10-bit analog digital converter (ADC), active inputs for automatic probe management, the minimum input sensitivity of 500uV/div and the memory buffer extended to 80Msample. The display, which is the largest capacitive display (10.1") with the highest resolution (1280 × 800 pixel) in its class, works just like your smartphone. Simply touch the screen to quickly navigate in pop-up menus and use gesturing to easily scale, zoom and move a waveform. The 10-bit A/D converter yields up to a fourfold improvement over conventional 8-bit A/D converters. You get sharper waveforms with more signal details. 40 Msample memory depth is available on each channel if all channels are active. When interleaved, 80 Msample are available to capture longer signal sequences for more analysis results. With the Rohde&Schwarz probe interface, all Rohde&Schwarz probing solutions can be used – for perfect connections to any DUT. The R&S®RTM3000 is more than just an oscilloscope. It includes a logic analyzer, protocol analyzer, waveform and pattern generator, digital voltmeter and dedicated operating modes for frequency analysis, mask tests and long data acquisitions. You can quickly and efficiently debug all kinds of electronic systems - and the R&S®RTM3000 satisfies the all-important rule of investment protection at a very attractive price. The R&S®RTM-B1 option turns every R&S®RTM3000 into an intuitive to use MSO with 16 additional digital channels. The oscilloscope captures and analyzes signals from analog and digital components of an embedded design – synchronously and time-correlated to each other. For example, the delay between input and output of an A/D converter can conveniently be determined using the cursor measurements. Protocols such as I2C, SPI and CAN/LIN frequently transfer control messages between integrated circuits. The R&S®RTM3000 has ver-satile options for protocol-specific triggering and decoding of serial interfaces. Selective acquisition and analysis of relevant events and data is possible. With the hardware-based implementation, smooth operation and a high update rate are ensured even for long acquisitions. This is advantageous, for example, for capturing multiple packetized serial bus signals. The integrated R&S®RTM-B6 waveform and pattern generator (up to 50 Mbit/s) is useful for educational purposes and for implementing prototype hardware. In addition to common sine, square/pulse, ramp and noise waveforms, it outputs arbitrary waveforms and 4-bit signal patterns. Waveforms and patterns can be imported as CSV files or copied from oscilloscope waveforms. You can preview signals before playing them back to quickly check signal correctness. Predefined patterns for e.g. I2C, SPI, UART and CAN/LIN are provided. For simultaneous measurements, the R&S®RTM3000 features a 3-digit voltmeter (DVM) and 6-digit frequency counter on each channel. Measurement functions include DC, AC + DC (RMS) and AC (RMS). Difficult to find faults often result from the interaction between time and frequency signals. The FFT function of the R&S®RTM3000 is activated at the push of a button and by simply entering center frequency and span. Thanks to the R&S®RTM3000 oscilloscopes' high- performance FFT functionality, signals can be analyzed with up to 128k points. Other tools include cursor measurements and autoset in the frequency domain. Mask tests quickly reveal whether a specific signal lies within de- fined tolerance limits. Masks assess the quality and stability of a DUT based on statistical pass/fail evaluation. Signal anomalies and unexpected results are quickly identified. When the mask is violated, the measurement stops. Each violation can generate a pulse output at the AUX-OUT connector on the R&S®RTM3000. This pulse output can be used to trigger actions in the measurement setup. The R&S®RTM-K15 history and segmented memory option increases the memory from 40 Msample to 400 Msample. You can scroll through past acquisitions and analyze the data using the oscillo- scope tools, e.g. protocol decode and logic channels. Serial protocol and pulse sequences are recorded practically without interruptions. Difficult to find faults often result from the interaction between time and frequency signals. The R&S®RTM-K18 spectrum analysis and spectrogram option quickly finds such errors. Like on a spectrum analyzer, parameters such as center frequency and resolution bandwidth can be adapted to the specific measurement task. 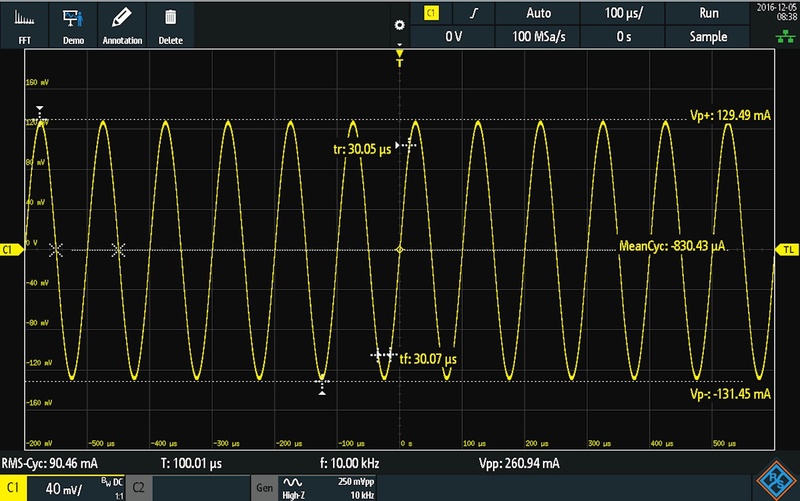 The oscilloscope automatically selects the relevant time domain settings. Optimum performance ensures the fastest multi- domain analysis in this oscilloscope class. Analysis tools support verification and debugging when developing current and voltage supply circuits. The R&S®RTM-K31 power analysis option facilitates analysis of the turn on/off behavior, the internal transfer function of the overall circuit, the safe operating area (SOA), the out- put signal quality and any loss.